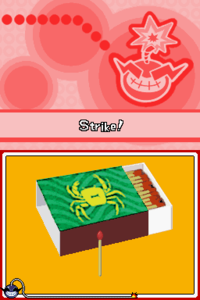 On Strike is one of Ashley and Red's microgames found in the Total Drag stage in WarioWare: Touched! and one of Wario Deluxe's microgames in WarioWare Gold. 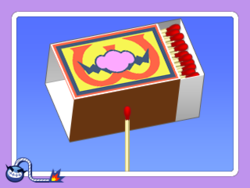 The objective of the game is to drag and rub the match against the brown portion of the box to light it. In the first two difficulties in WarioWare Gold, once the match is lit, Wario's face appears. 1st level difficulty: There is a large matchbox to rub. A crab is depicted on the matchbox. In WarioWare Gold, Wario's nose and mustache are depicted instead. 2nd level difficulty: There is a medium-sized matchbox to rub. A red and black design is depicted on the matchbox. In WarioWare Gold, Wario's biker helmet is depicted instead. 3rd level difficulty: There is a thin matchbox to rub. Four different-colored panels are depicted on the matchbox. In WarioWare Gold, Wario's head is depicted instead, and the player needs to also blow out the match, as once lit, there's an image of some explosives. There is a chance it can show up by playing one of Mike's microgames. This page was last edited on December 18, 2018, at 16:16.